If SA subscribes to internationals standards on carbon offsetting, the country will miss out on developmental opportunities spotted by local organisations. Inequality is back in focus in SA following a damning World Bank report released in late 2018 and presidential commitment to economic inclusion at the launch of the “stimulus and recovery package” and at the “jobs summit”. There is growing political currency attached to evoking the country’s income and consumption disparities. Inequality has become SA’s soft underbelly, fair game for populists and profiteers. But it should never have come to this. Since inheriting an economy that was designed to make us unequal, SA’s inability to improve its indicators of inequality is the result of incomplete land reform, water allocation reform and broad-based black economic empowerment (BEE) programmes, compounded by private sector apathy in assuming that this was not their problem. The failure is a source of frustration and embarrassment to all of us involved in public policy. If you scratch below the surface of the Gini co-efficient or the Theil index, you find that current access to public services is actually significantly more equal than in 1994 and that every living standard measure (LSM) group is better off than they were then in nominal terms. However, translation of these benefits into income and expenditure has been uneven. SA’s progress since 1994 has “left people behind” — to misuse the language of the sustainable development goals — and amplified inequality. Unequal economies lack trust, struggle to sustain growth and deals with systemic challenges such as climate change. They are characterised by less hope, less tolerance and more anomie than equal societies. For South Africans, acute and persistent inequality provides a painful reminder of historic divisions. The carbon tax is an innately progressive policy instrument, but its ability to reduce inequality is further affected by the manner in which revenue is recycled through the fiscus and the offset mechanism. SA has learned that tackling inequality is difficult for a small, open economy. Global capital markets leave little room for the types of innovation and programmes that can address inequality, especially when these are perceived to threaten company profits. If the country is to change this, it needs to take the opportunities available, and it is the sense of missed opportunity that makes the proposed guidelines for carbon offsets, rereleased for a short window of comment at the end of 2018, so disappointing. Admittedly the carbon tax guidelines speak to an esoteric community. Not many people in SA have experience of carbon trading. This may be why the policy guidelines went almost unnoticed. The proposed path, however, will affect us all. SA’s carbon tax will be implemented from June 1 2019. Greenhouse gas emissions correlate closely with consumption and affluence and the burden of climate change is carried disproportionately by the poor. Given this, the carbon tax requirement that emitters pay for the cost they impose on society removes a subsidy that, historically, has benefited the affluent. The carbon tax is an innately progressive policy instrument, but its ability to reduce inequality is further affected by the manner in which revenue is recycled through the fiscus and the offset mechanism. The offset mechanism allows emitters to reduce their carbon tax exposure by 5%-10% by investing in projects that reduce emissions. 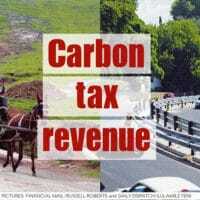 It provides flexibility and the scope for innovation in the manner that carbon tax revenue is recycled. But carbon offsetting is controversial. Adversaries suggest it allows companies to buy their way out of trouble without changing their behaviour, and that it does not lead to net declines in emissions. Those who have been involved in the offset market over the past two decades know that the greater controversy, and associated challenge, entail ensuring that offset money actually reaches the right projects and does not simply support projects that would have happened anyway. The flagship carbon offset scheme, the clean development mechanism (CDM), was established in 2000 by the UN under the Kyoto Protocol. As the name suggests, the intention was to channel investment to development projects that also reduced emissions — the type of projects African countries so desperately need. The system ground to a halt as a limited number of accredited auditors spent inordinate amounts of time and project money trying to establish the exact quantum of saved emissions. The required proof of a counterfactual involving the avoided emission of the colourless, odourless carbon dioxide gas, induced anxiety in legal and financial circles and saw accredited consultants cashing in as processes became contested and protracted. One of the unwitting side effects was that project approval became expensive, favouring large-scale emitters with deep pockets. The scale bias introduced by high transaction costs precluded projects generating carbon savings of 10,000 tons of carbin dioxide a year or less. Sadly, it is these smaller projects, such as waste recycling, energy-efficient cooking stoves and household scale renewable energy, that deliver the most direct development benefits. As the Kyoto Protocol drew to a close in 2012, three CDM failings became clear: the flagship instrument had delivered less than 1% of the emission reductions required by science to curb global warming to safe levels; although fee structures were generally opaque, less than half the money used to offset ended up with projects — the balance accruing to consultants, auditors and registries; and less than 2% of the invested money ended up in African projects — a poor return for a developmental instrument in the 21st century. In recent years a number of alternative carbon offset standards and registries have emerged. The two most prominent, the verified carbon standard (VCS) and the gold standard, are based in Washington DC and Geneva respectively, and have done little more than the CDM to reduce fees or meet developmental needs in Africa. It is puzzling then, that in selecting standards through which South Africans may offset their carbon tax obligations, the National Treasury has proposed CDM, VCS and the gold standard as the preferred standards, oblivious it would seem to where these standards will take us. The rationale, we are told, is that these are “international standards”, but SA has its own registries and carbon auditors, all of whom trade internationally with distinction and acclaim. The local efforts have proven adept at understanding context, investing in good projects, restricting audit fees and supporting small-scale developmental needs. They have, for example, generated transactions between Nedbank (SA’s carbon neutral bank) and waste pickers in Imizamo Yethu and between the Table Mountain Cable Car Company and households in Kuyasa. They have shown the world that carbon offsetting can be developmental, and that carbon transactions provide a bridge between otherwise divided members of our society. The projects local standards support are designed to deliver development benefits and carbon savings, in the intuitive understanding that these issues have to be dealt with in concert to succeed — a point underscored in the Intergovernmental Panel on Climate Change’s 2018 special report. The projects are significant but too small to qualify under the proposed offsetting standards supported by the carbon tax. Rather than experience a much-needed boost when the carbon tax commences, they will instead find themselves excluded and will forego the money they have been receiving through voluntary offsets. In the process, another golden opportunity to tackle inequality will pass SA by. Our new year’s wish should be that SA moves beyond rhetoric about inequality and past injustices; that in 2019 we stop looking to international solutions to our problems and begin to trust each other to forge meaningful working relationships across the divides of the economy and society. For this to happen we will have to become better at identifying rare policy opportunities, such as the carbon offset guidelines, to build bridges across existing divides of inequality. • Cartwright is a researcher at the African Centre for Cities, lead author of the IPCC’s Special Report on 1.5°C of warming, founder of the NPO Promoting Access to Carbon Equity and director at Credible Carbon. This article by Anton Cartwright was first published on BusinessDay on 14 January 2019. Anton is an economist with Masters degrees in Development Economics and in Environmental Change & Management. His BSc is in Horticulture and Agricultural Economics.